Introduction: The efficacy of conventional therapy viz. finasteride and minoxidil in androgenetic alopecia (AGA) that is based on both preventing hair loss and promoting new hair growth, varies between 30% and 60%. This has led to a large number of patients unsatisfied who demand for a better cosmetic coverage over the scalp. Microneedling has recently been reported to be promising, effective and a safe treatment modality in the treatment of AGA. This augments the response of conventional therapy. 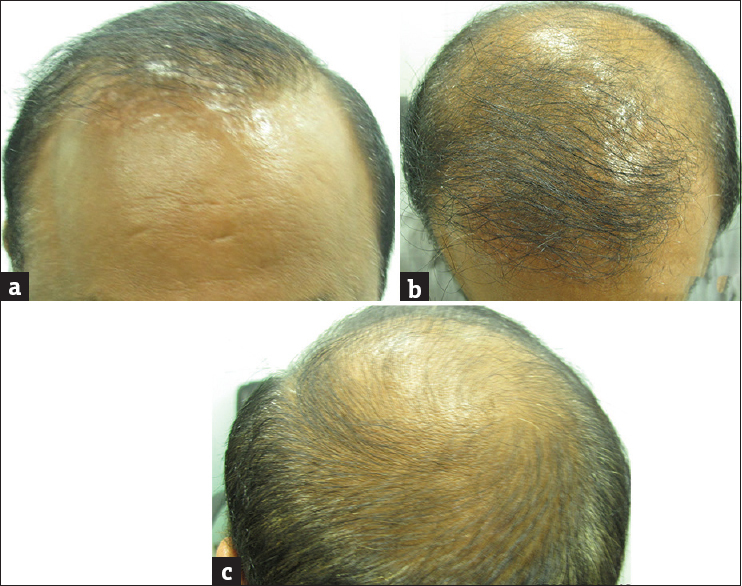 Materials and Methods: Four men with AGA were on finasteride and 5% minoxidil solution since 2 to 5 years. Though there was no worsening in their respective AGA stages with the therapy, they showed no new hair growth. They were subjected to microneedling procedure over a period of 6 months along with their ongoing therapy. Patients were assessed with the use of the standardized 7-point evaluation scale and patients' subjective hair growth assessment scale. The patients were followed up for 18 months post microneedling procedure to assess the sustainability of the response. Results: All patients showed a response of + 2 to + 3 on standardized 7-point evaluation scale. The response in the form of new hair growth started after 8-10 sessions. The patients' satisfaction was more than 75% in three patients and more 50% in one patient, on patients' subjective hair growth assessment scale. The obtained results were sustained post procedure during 18 months follow-up period. Conclusion : Treatment with microneedling showed an accelerated response with addition of microneedling procedure leading to significant scalp density. 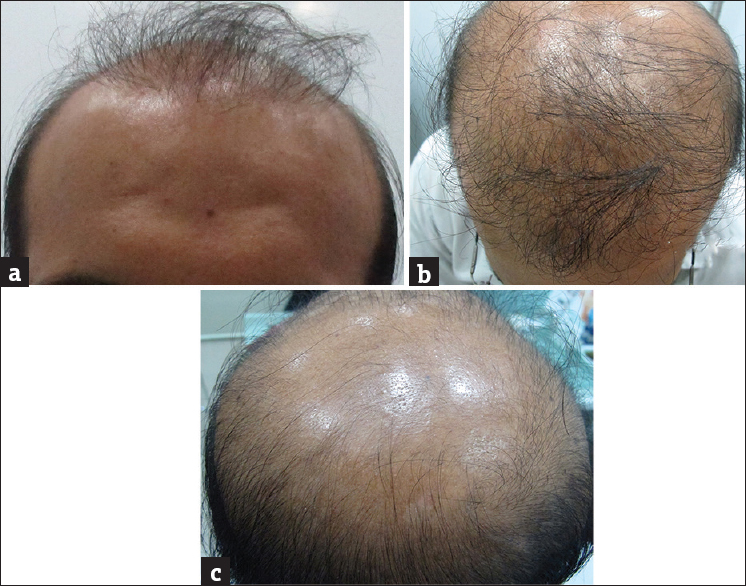 This is the first case series to report the boosting effect of microneedling with respect to new hair follicle stimulation in patients with androgenetic alopecia who were poor responders to conventional therapy. Efficacy of conventional therapies (viz. finasteride and minoxidil) in the treatment of androgenetic alopecia with respect to new hair growth is moderate. Microneedling has recently been reported to be promising and safe treatment modality in the treatment of AGA. Case 1 - A 30-year-old male was suffering from AGA since 8 years. He was on oral finasteride and topical 5% minoxidil regularly since 4 years and also had underwent hair transplantation surgery 2 years ago. 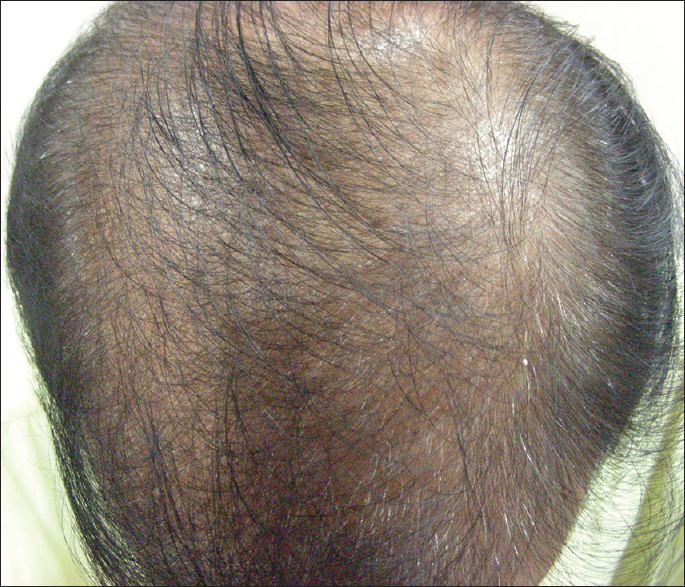 He reported an arrest in hair loss but was unsatisfied in terms of cosmetic scalp coverage. 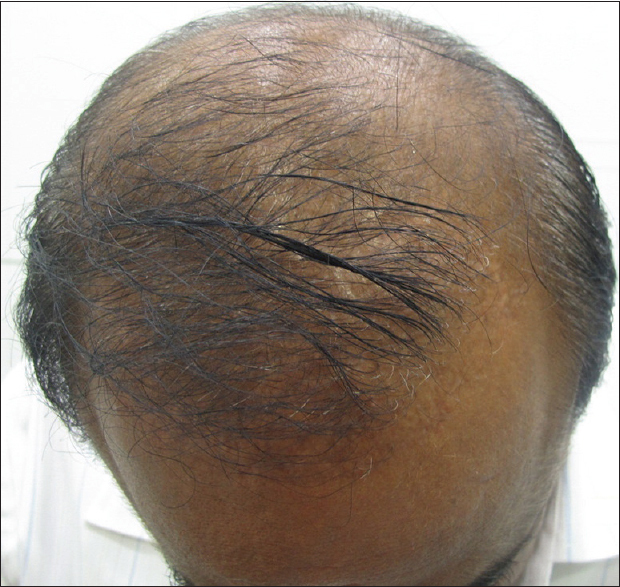 On examination, he had grade V Hamilton Norwood pattern of hair loss with few transplanted hairs seen on frontal area and thin hairs on the temporal and midscalp area [Figure 1]. 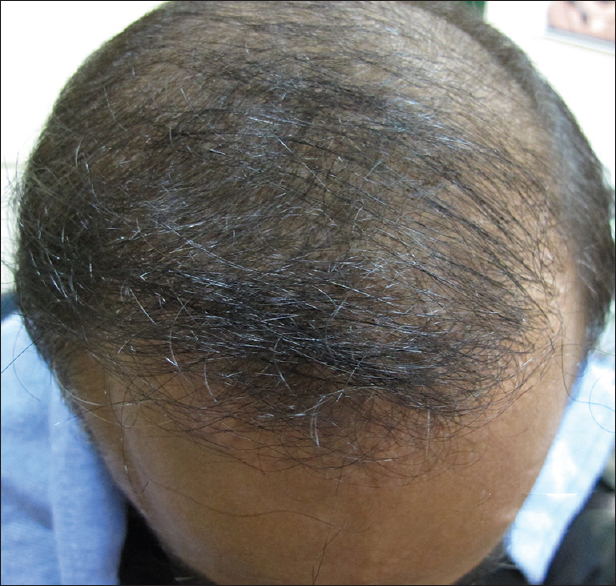 Case 3 - A 35-year-old male with grade V hair loss was on finasteride and minoxidil for over 2 years. He had no significant improvement with respect to new hair growth. 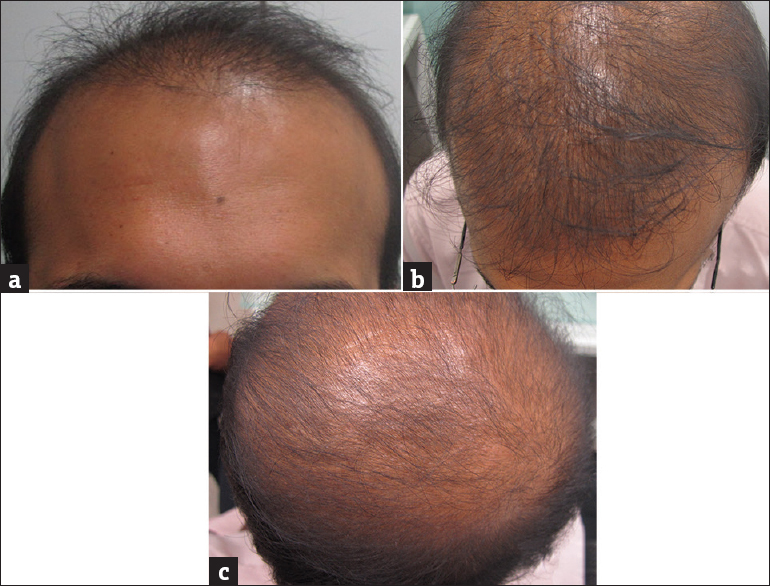 He wished for a better scalp coverage of hair [Figure 3]a-c.
Case 4 - A 40-year-old male with female pattern type III of hair loss was taking conventional therapy for over 3 years but unsatisfied with respect to new hair growth [Figure 4]. The scalp was surgically cleansed with betadine and normal saline. A dermaroller of 1.5 mm sized needles was gently rolled over the affected areas of the scalp in longitudinal, vertical, and diagonal directions until mild erythema was noted; this was considered as the end point of the procedure. Each procedure lasted for about 20-25 minutes. The patients were advised to continue with their ongoing therapy with finasteride and minoxidil. All the patients were subjected to microneedling procedure weekly for 4 sessions initially and then fortnightly for subsequent 11 sessions. The total duration of microneedling treatment lasted for 24 weeks. Baseline and post treatment photographs (at week 24) were taken on a tailor-made stereotactic device and the patients were assessed with the use of the standardized 7-point evaluation scale (-3 = greatly decreased, -2 = moderately decreased, -1 = slightly decreased, 0 = no change, +1 = slightly increased, +2 = moderately increased, +3 = greatly increased). After completion of 15 sessions of microneedling, all patients were advised to continue with finasteride and minoxidil. The patients were followed up for 18 months after the last microneedling procedure to assess the sustainability of the response. All patients reported subjective increase in thickness of thin hair after a month of initiation of microneedling procedure. 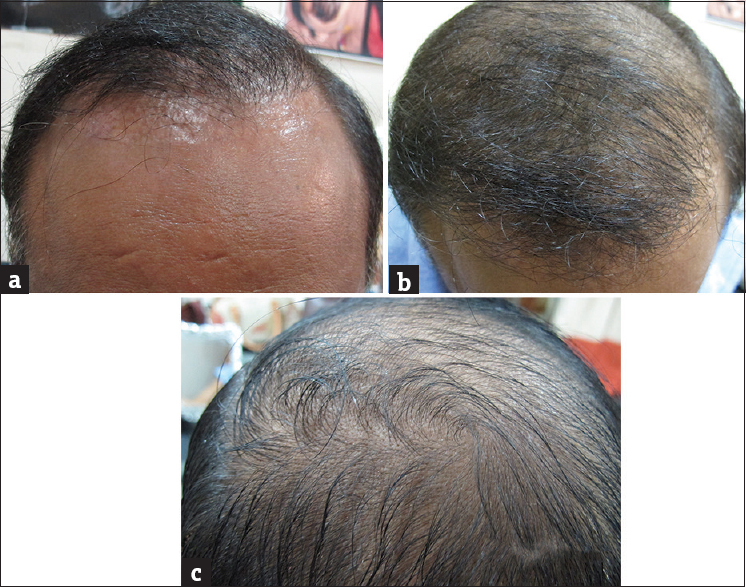 After 3 months, new hairs were noticed on scalp surface and by end of 6 months significant scalp coverage was noted with the response of grade +2 to +3 on the standardised 7-point evaluation scale [Figure 5], [Figure 6], [Figure 7], [Figure 8]. At end of 6 months, three patients rated more than 75% improvement and one patient (Case 2) reported more than 50% improvement on patients' subjective evaluation of hair growth and were highly satisfied with the response. At the end of 18 months of follow up, all patients had maintained the same response that was achieved at the end of last session of microneedling. AGA affects up to 30% of men below the age of 30 years and approximately 50% of men above 50 years of age. There is a significant psycho-social impact associated with it. There has also been a growing demand among the patients to seek treatment, not only to prevent the existing hair loss but more so to regain new hair with good thickness and density. Cochrane review reports that the efficacy of finasteride and minoxidil for AGA varies between 40% and 60%. This implies that a significant number of patients go bald despite therapy.The reported efficacy is in terms of arresting of ongoing hair loss and new hair regrowth. Data on the efficacy with regards to only new hair regrowth with the above therapy is not documented. A large proportion of patients with AGA remain unsatisfied with respect to new hair growth with the existing therapies. One of the reasons for this could be the multiple factors implicated in the pathogenesis of AGA which involves not only DHT but also inflammation, genes, signalling pathways  (stimulatory pathways like Wnt/B catenin, stat 3 and Shh and inhibitory pathways of Dkk-1, Dickkopf-related protein 1 and BMP 4); growth factors, activation of stem cells of the hair bulge and improving vascularity. The existing conventional therapies (i.e. finasteride and minoxidil) fail to target all of them. Overexpression of hair growth-related genes, vascular endothelial growth factor, B catenin, Wnt3a, and Wnt10 b as documented in animal studies. Our first in man study demonstrated the augmented effect of microneedling in promoting hair growth in men with AGA. We have modified our microneedling protocol to reduce frequent visits of the patients to the clinic. 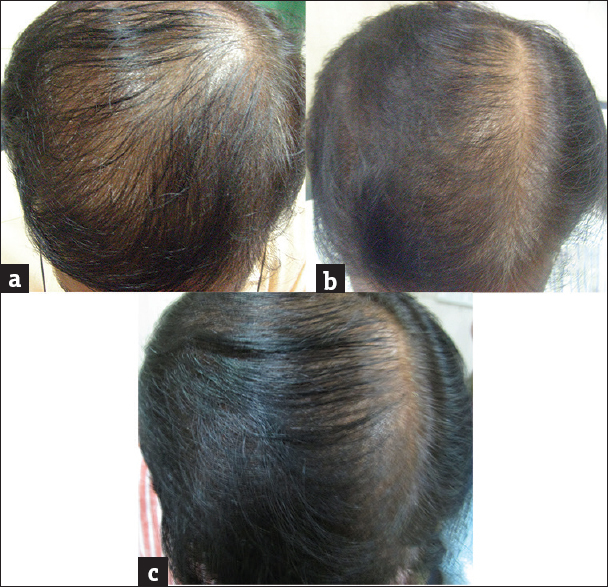 The present case series highlights the beneficial effect of microneedling in promoting new hair regrowth even in patients showing poor response to conventional therapy by targeting other pathogenetic mechanisms of AGA. The pathogenesis of androgenetic alopecia is multifactorial and is still not clear. The efficacy of the conventional therapies with respect to new hair growth is unsatisfactory. The present case series shows that the addition of microneedling procedure augments the response even in poor responders to conventional therapy. As microneedling targets multiple pathogenetic factors of AGA, we are of the opinion that this procedure should be offered to patients with AGA for new and faster hair follicle stimulation. However, the total number and frequency of sessions and long-term sustainability of response of microneedling need to be evaluated within a larger population. Tosti A, Duque-Estrada B. Treatment strategies for alopecia. Expert Opin Pharmacother 2009;10:1017-26. Mella JM, Perret MC, Manzotti M, Catalano HN, Guyatt G. Efficacy and safety of finasteride therapy for androgenetic alopecia: A systematic review. Arch Dermatol 2010;146:1141-50. Schweiger ES, Boychenko O, Bernstein RM. Update on the pathogenesis, genetics and medical treatment of patterned hair loss. J Drugs Dermatol 2010;9:1412-9. Dhurat R, Sukesh MS, Avhad G, Dandale A, Pal A, Pund P. A randomized evaluator blinded study of effect of microneedling in androgenetic alopecia: A pilot study. Int J Trichology 2013;5:6-11. Hamilton JB. Patterned hair loss in man: Types and incidence. Ann NY Acad Sci 1951;53:708-28. Valente Duarte de Sousa IC, Tosti A. New investigational drugs for androgenetic alopecia. Expert Opin Investig Drugs 2013;22:573-89. Leirós GJ, Attorresi AI, Balañá ME. Hair follicle stem cell differentiation is inhibited through cross-talk between Wnt/β-catenin and androgen signalling in dermal papilla cells from patients with androgenetic alopecia. Br J Dermatol 2012;166:1035-42. Jeong K, Lee YJ, Kim JE, Park YM, Kim BJ, Kang H. Repeated microneedle stimulation induce the enhanced expression of hair-growth-related genes. Int J Trichology 2012;4:117. Kim BJ, Lim YY, Kim HM, Lee YW, Won CH, Huh CH, et al. Hair follicle regeneration in mice after wounding by microneedle roller. Int J Trichology 2012;4:117. O'Toole EA, Mellerio JE. Wound healing. In: Burns TB, Cox N, Griffiths C, editors. Rook's Textbook of Dermatology. 8 th ed. United Kingdom: Blackwell Publishing; 2010. p. 14.1-27. Modification of microneedling protocol to reduce frequent visits of the patients to the clinic. It is the first case series to report the boosting effect of microneedling with respect to new hair follicle stimulation in patients with androgenetic alopecia who were poor responders to conventional therapy.